If you’re starting to plan your holiday decorations you may come across the term C7 when referring to Christmas lights. I know because I came across this term when doing research for a story on Christmas decorations and initially had no clue as to what it referred to. With some digging I found a wealth of information about this little light bulb that I now share with you. 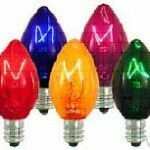 A C7 Christmas bulb is the smaller of the two sizes of traditional Christmas lights; the larger one being a C9. Larger than the popular little white holiday lights, but smaller than C9’s, these lights are often seen in bright candy colors. However, you may occasionally find them offered in other colors and decorative styles. Originally manufactured by GE, these bulbs were introduced in 1934 and gradually gained popularity until in the 1950’s they were the most commonly used bulb for Christmas lighting. What set these GE holiday lights apart from their predecessors was their parallel circuits. Parallel circuits allowed a string of these bulbs to stay lit even if one of the bulbs burned out. Prior to the release of this type of product, when one Christmas bulb went bad the entire string went dim. The resulting challenge was the frustrating and time consuming task of replacing and testing each bulb individually until the offending bulb could be found. I know what a challenge this can be because as a child in the 60’s hunting down the burned out bulbs in old light strings was often assigned to me. Many years I had the misfortune of being the Christmas light tester. Anyway, when shopping for holiday lights, you’re likely to find C7 bulbs available in both solid and see-through styles. The solid colored bulbs are referred to as ceramic bulbs, while the transparent type, where you can see the filament inside, are termed transparent bulbs. Which you choose is really a matter of taste, but I would suggest not mixing the two types of Christmas bulbs in your display or on your tree for maximum effect. A set of C7 bulbs should last you a good, long time. A life expectancy of 10 or more years is not uncommon for a set of these lights. The fact that they are intended to be used indoors goes a long way in helping these lights last a long time. If you need a string of lights for outside decorating, choose a string of the larger C9 type lights instead. These larger bulbs make a better outdoor show and are insulated to stand up to cold and wet conditions. C7 lights are also fairly low consumers of energy. They use about 5 watts per bulb which is more than mini lights, but you get far more illumination from C7 type lights. Anyway you look at it, chances are you won’t go wrong if you purchase some C7 for you holiday decorating projects. We all know that when it comes to the holidays, some of our neighbors go all out on the decorating. From Santas to fully-animatronic nativity scenes encased in plexi-glass, people love lighting up the block when it comes to dressing up the house. For those so devoted to shining like a star, there is Bronner’s Christmas Wonderland. Located in Frankenmuth, Mich., Bronner’s is home to over 50,000 Christmas related decorations, novelties and gifts. Upon entrance, the first time customer will be overwhelmed by over 350 different Christmas trees decorated with over 6000 different ornaments. Closed only 4 days out of the year, Bronner’s is visited by millions every 365 days. Opened in 1945 by Wally Bronner, Bronner’s Christmas Wonderland is a haven for the Christian world and those who just love the holidays. On their website, says this about Bronner, “Little did he dream that his small business would one day become the world’s largest Christmas store visited by millions of people.” Two million to be fairly accurate, come from all over the U.S. to see their over 2,000 group tours every year. Bronner’s is undoubtably the largest holiday decor store in the world. Here are some fun facts about this mammoth holiday retailer. – More than 700 whimsical, animated figures enchant guests in the salesroom. – As many as 100,000 individual lights illuminate the salesroom. – Decorations and gifts from 70 nations can be found at Bronner’s. – Bronner’s stocks “Merry Christmas” ornaments in more than 70 languages. – About 1,000 figurines comprise Bronner’s Hummel collection. – There are over 500 different styles of Nativity scenes for guests to enjoy in the Bronner salesroom. – Bronner’s patented life-size Nativity has been shipped to all the continents. – Over 6,000 different styles of unique ornaments are featured at Bronner’s. – Bronner’s artists personalize over 100,000 ornaments annually. One of Bronner’s ornament artists has personally handpainted nearly -million ornaments during her 25 years at Bronner’s. – If all the light sets sold in one year at Bronner’s were stretched out in a continuous line, they would span approximately 530 miles. – Nearly 700,000 feet of garland are sold at Bronner’s annually. – Half of the items Bronner’s carries sell for under $10, and two thirds are priced under $20. – The record number of Bronner guests in one day was 25,981 on Nov. 26, 1994. 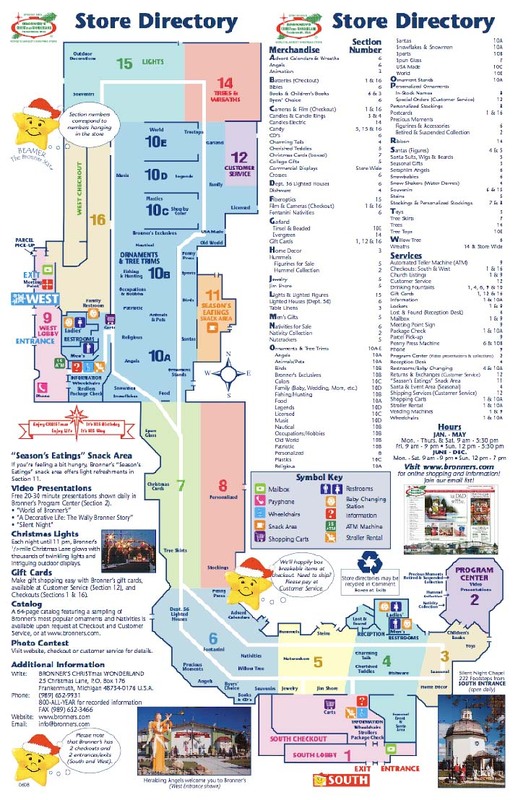 – Each year over 2000 motorcoach tours visit Bronner’s. – Virtually every month, Bronner’s is visited by travelers from all 50 states, Canada and many other nations. – Movie star John “the Duke” Wayne ordered a Santa suit from Bronner’s by telephone on December 15, 1976. – Approximately 100,000 outdoor Christmas lights illuminate Bronner’s grounds every evening throughout the year. – Christmas Lane, Bronner’s own thoroughfare, is 1/2-mile long. – The overall size of Bronner’s building is 320,000 sq. ft. (approx. 7.35 acres or 5.5 football fields of space) with 96,000 sq. ft. (2.2 acres 1.7 football fields of space) devoted to the salesroom. This year how about a theme for your Christmas lights decorations? The most common themes of recent years have involved all white Christmas lights or more recently blanketing the home, porch, windows, eaves and outdoor tree lights with icicle holiday lights. This year how about something more original? There are many more options available for Christmas light decorations than these themes and variations of white lights suggest. Let’s pick a more original theme–say bows. You can start by decorating your Christmas tree all over with them. The bows shown here are gold, but more creative options abound. What’s up with those Pink Christmas Lights? Right now, I’m partial to bows made of pink and white striped or polka-dot grosgrain ribbon. Attach little ornament hooks or mini rubber bands to the back of these bows and presto, you’ve got instant bow Christmas tree decorations. Mix these bow ornaments with pink Christmas lights or even the little white Christmas lights, ( f you must) and you’ve got a unique theme all you own–or in this case a theme that currently tickles my fancy! The pretty-in-pink Christmas tree shown here is yet another example of my current fetish of working in pink for holiday decorations. Purple Scores a Hit for the Holidays! And while we’re talking color, what about creating Christmas lighting and decorating ideas in other unique living colors? Who says we can’t do purple for Christmas decorations? These balls cover a whole range in shades of purple and blend nicely with little purple Christmas lights. Orange is the New Red? What about orange? I’m sure you’ve never really considered orange to be a Christmas color, but really why not? Christmas ornament, Artist Eunice Saunders, mentions orange as the newest of Christmas colors on her website www.eunicesaunders.com. 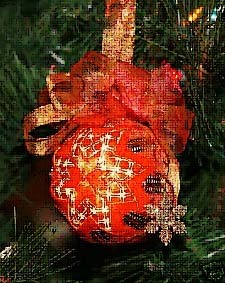 There you can find unique, artisan-created Ornaments by Nisha, like this one for sale. If you’re planning to stick with orange as a theme-color, you might also want to add some orange Christmas lights to the exterior of your home as well as to trees–both indoors and out. Anyway, you look at it, Christmas lights decorations don’t have to be just white lights anymore. Choose a theme, a symbol, an icon or just a color and let it go wild!